Overhead Powerlines are commonplace all over the world as they feed us the energy that drives society every day, but this jungle of connecting wires is often used as a highway by the local fauna. In the absence of heavy forests, the most adapted creatures of the neighbourhood have transitioned to using distribution lines as their method of staying off the ground and moving around a neighbourhood. It may be a modern equivalent of traversing vines in a jungle, but their patronage can cause severe reliability headaches for utilities when an unfortunate animal provides a clean phase-to phase linkage, initiating faults which can cost a fortune in lost energy supply. One of the most common solutions to this issue is the application of “Bird-guards” or animal guards. These devices provide additional insulation for exposed conductors and terminals, mitigating the risk of wildlife-initiated faults. By providing UV resistant insulation on the terminals, utilities can achieve major mitigation of wildlife-initiated faults. The hometown of NOJA Power Switchgear, Brisbane Australia, is a perfect example of a neighbourhood where the local ringtail and brushtail possums are a significant headache for the local energy utility. These animals are adept climbers, and are notorious for moving around neighbourhoods only on power lines. Borne of this environment, the NOJA Power OSM Recloser is designed with this challenge in mind, as the standard product is shipped with bird guards for every bushing. The application of bird guards also serves to greatly improve the reliability of distribution assets. All overhead switchgear can be subject to wildlife issues, and high energy faults around these devices have the potential to cause damage to the utility asset. 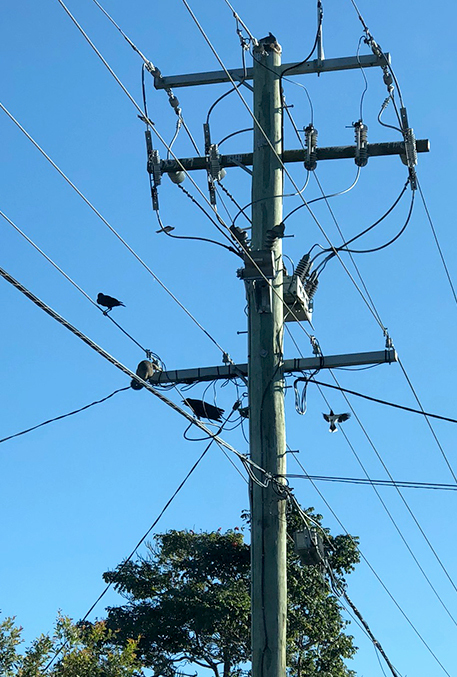 Bird Guards, such as the units shipped with NOJA Power OSM Reclosers, are a cost-effective solution to improve reliability of your network distribution assets. "Bird guards are a small additional investment to protect the investment in the capital equipment asset from accidental damage due to short circuits associated with wildlife," says NOJA Power Group Managing Director Neil O’Sullivan. "It also has significant environmental benefits to protect that wildlife." NOJA Power OSM Reclosers are in service in 87 countries around the world today, with thousands of units installed in high-wildlife activity regions. The NOJA Power bird guard design reduces powerline wildlife fatalities whilst providing increased reliability. To find out more, visit www.nojapower.com.au or contact your local distributor. Now, if only this writer could convince the possums to stay off his roof too!